TACLOBAN CITY – The Regional Trial Court Branch 36 in Carigara, Leyte recently ordered the Department of Environment and Natural Resources to dispose a seized motorboat, two (2) boat keels and 24 pieces of Lauaan lumber without legal documents. The said court also meted penalty to Santiago Villamor and Joseph Villamor who have been found guilty for violation of Section 68 of PD 705 known as the Revised Forestry Code of the Philippines, as amended. Executive Judge Lauro A. P. Castillo, Jr. in an order dated April 15, 2010 directed DENR Regional Executive Director Primitivo C. Galinato, Jr. to dispose the 236 board feet lawaan lumber valued at P6,372.00 which was confiscated from the Villamors, Ms. Purificacion Daloos, chief of the DENR information office said. The motorboat with complete accessories which was used as conveyance in the transport of the lumber as well as two boat keels with no assigned value were also ordered confiscated in favor of the government and was also ordered for disposal in accordance with existing procedures of the DENR. The same court sentenced Santiago Villamor, a fisherman from Brgy. Pinarigusan, San Miguel, Leyte, an imprisonment ranging from 7 years, 4 months and 1 day of prison mayor as the minimum to 11 years, 6 months and 21 days of prison mayor as the maximum. In the meantime, the case is archived with respect to the other accused Joseph Villamor who remains at large, to be revived upon his arrest. The court order revealed that the prosecution evidence has satisfactorily proven that the accused Santiago Villamor was apprehended while at sea on February 8, 2003 at around 6:30 o’clock in the early evening in the possession of undocumented lumber of various sizes and two (2) boat keels by the Bantay Dagat Team headed by PO3 (now SPO2) Marlon Acuin of San Miguel, Leyte. The said forest products and conveyance were temporarily held in custody by the Mayor of San Miguel, Leyte and later turned over to the DENR, CENRO, Palo, Leyte. RED Primitiivo C. Galinato, Jr. thanked the support of the RTC for helping in the speedy prosecution of cases against forest law violations. He further requests the other RTCs in Region 8 to take timely prosecution of the other environment related cases filed in their respective sala. The DENR had intensified its forest protection efforts specifically in illegal logging hotspot areas. This is consistent with the management direction of the Regional Department which is “From the Ridges to the Reefs”. This direction considers that that the forestlands or upland areas should be amply protected as anything that happens in the forest would certainly affect the balance of the lowland areas including the coastal and marine areas. MAASIN CITY, Southern Leyte – With a landslide victory in the province of Southern Leyte, the Lakas-Kampi-CMD party candidates in the May 2010 polls at the provincial level were officially proclaimed by the Provincial Board of Canvassers, Friday, May 14 at exactly 4:30 in the afternoon. After the remaining official ballots from the municipalities were finally fed into the Precinct Count Optical San (PCOS) at the New Legislative Building, Provincial Capitol, the winning candidates, all from the administration ticket were declared. It was led by the Board of Canvassers Chairman Provincial Comelec Election Officer Antonio Gulay Jr., Department of Education Division Superintendent Violeta Alocilja, and Provincial Fiscal Antonino Ruiz. Re-electionist Congressman Roger G. Mercado led in the congressional slate with 125,912 votes against former Congressman Aniceto Saludo Jr. who garnered 61,595 votes provincewide. While, younger brother Damian G. Mercado, incumbent governor got 132,696 votes over Marissa Y. Lerias with 47,430 votes. Other candidates proclaimed were re-electionist Vice-Governor Miguel Maamo II, and the Sangguniang Panlalawigan members from the two districts of the province. The 1st District SP members who won the poll were: re-electionists Alberto Esclamado, Cesar Rey, Teopisto Rojas, Jr., and Felicula Escano, the former mayor of Tomas Oppus replacing Agustin Escano who ran as mayor of same town. While the 2nd District Sangguniang Panlalawigan members who were declared as winners were as follows: incumbent Daisy Gamale, Roberto Lagumbay, Junbee Fernandez and new comer Abelardo Almario. TACLOBAN CITY – The Lockheed Detective & Watchman Agency, Inc. voluntarily settled and paid its twelve (12) security guards the total amount of P187,296.00 in a labor inspection case before the DOLE Southern Leyte Field Office. The twelve security guards received an average of P15,808.00 each. Upon payment of the above-mentioned findings of underpayments by the DOLE Inspectorate, DOLE Regional Director Forter G. Puguon issued an Order dated April 16, 2010 considering the case closed and dropped from its calendar of cases. The labor inspection case stemmed from a complaint of two Security Guards of Lockheed Detective and Watchman Agency assigned at the Liloan Ferry Terminal, Philippine Ports Authority, in Liloan, Southern Leyte for underpayment of the minimum wage, 13th month pay, night shift differential pay, holiday pay and service incentive leave pay. Chief Labor and Employment Officer Fe Norma Valuis, head of the DOLE Southern Leyte Field Office, recommended to Regional Director Puguon the immediate conduct of an inspection at the said workplace/establishment. Accordingly, Puguon issued an Authority to Inspect to Security Officer & Labor Inspector Francisco Segovia directing him to immediately conduct inspection on May 13-15, 2009 of the Security Agency at the Liloan Ferry Terminal, Philippine Port Authority in Liloan, Southern Leyte. The inspection resulted in findings of underpayment of the minimum wage, 13th month pay, night shift differential pay, and non-payment of holiday pay and service incentive leave pay, with final amount of P187,296.00. TACLOBAN CITY – No less than Philippine National Police Region 8 Director Rey Lañada went to Naval, Biliran on May 13 in the morning in order to talk to the leaders of the rallyists at the Biliran Provincial Capitol. After the talk, the Philippine Information Agency learned that the PCOS machines at the Biliran Capitol are on the way to the PCOS hub in Tacloban with the Comelec representatives and in convoy were Director Lañada and some PNP members together with the leaders of the rallyists in convoy, also. It was learned that the leaders of the rallyists requested the PNP Director that they also follow the cars carrying the PCOS machines to make sure that they are really brought to the PCOS Hub. Late in the afternoon of May 13, the Philippine Information Agency who were waiting for the convoy to arrive, witnessed the arrival of the convoy and the counting of the PCOS machine which were brought in from Biliran. The Philippine National Police in the Region said that the situation in Biliran is under control and in fact, no police augmentation was done believing that the Biliran Provincial Police Office can handle the situation. It would be recalled that after the proclamation of the winning candidates particularly Governor Roger Espina as the elected congressman, the supporters of incumbent Congressman Chong demanded for the holding of manual count and this demand was manifested through a rally in front of the provincial capitol. Allegedly, the rallyists, did not want the PCOS machines be removed from the provincial capitol. However, with the presence of PNP Director Lañada, cooler heads prevailed and the PCOS machines were safely returned to the Comelec PCOS hub in Tacloban. TACLOBAN CITY – The Philippine Drug Enforcement Agency will cause the destruction of drug evidence on May 25, 2010, at 8:30 in the morning, at the Balyuan Convention Center Grounds in Tacloban City. PDEA 8 Regional Director Julius R. Navales informed that to be included in the burning are the sixty-seven (67) bricks of cocaine which are still in the custody of PDEA 8. Also included in the burning are undetermined amount of methamphetamine hydrochloride popularly known as shabu, marijuana and other drugs obtained from anti-drug operations which have been cleared for destruction by the courts, pursuant to Section 21 Article II of Republic Act 9165 and Dangerous Drugs Board Regulation No. 1 Series of 2002, Director Navales added. The drug materials that will be burned and destructed were evidences of cases filed that were already given a court decision. Under Section 21 of RA 9165, it is mandated that all the drug evidences that was given court decision should be turned-over to PDEA for proper disposal. Director Navales said the destruction of these prohibited drugs is part of the agency’s standard operating procedure so that this substance could no longer be of use or sold. Expected to witness the burning or destruction are members of the PDEA 8, Philippine National Police, other stakeholders and members of the local tri-media. CAMP LUKBAN, Catbalogan City, Samar – 250 young and willing candidates for soldier course were received by the Army’s 8th Infantry Division through a simple opening ceremony held at the command’s hollow ground, 9:00 A.M., Wednesday. Traditional military reception took place after the opening ceremony where candidates underwent series of military exercises as introduction of the exercises they will perform as frequent as possible during their training phases to develop their physical stamina. The simple ceremony was graced by the 8ID’s head, Major General Arthur Tabaquero as speaker. In his message, Major General Tabaquero reminded the candidate soldiers that aside from having a tough and rigid training, they will be separated from their families. General Tabaquero also vowed that the trainees will be honed and developed into disciplined, determined, courageous, mentally sharpened and loyal soldiers after the training. He also encouraged them to value the opportunity of being one of the chosen out of the thousands who keep on dreaming to join the ranks of the living heroes. Meanwhile, General Tabaquero also reminded the members of the training directorate who will handle the training. “To the training Committee, I encouraged you to conduct the training professionally so that we can produce disciplined, committed and well-equipped soldiers after the training” the good general says. The ceremony were also witnessed by all officers, enlisted personnel, civilian employees, parents and other wait-listed applicants of candidate soldier course. The newly opened course is the first batch among the three batches of soldier course for calendar year 2010. Two (2) more batches are expected to convene two (2) to three (3) weeks from press time that will fulfill the 600 quota of recruit for the 8ID alone for the calendar year 2010. CATBALOGAN CITY – The three Tans, comprised of Milagrosa Tan and siblings Sharee Ann Tan and Stephen James Tan were proclaimed Representative (Samar’s 2nd District), Governor and Vice Governor respectively past 5p.m. 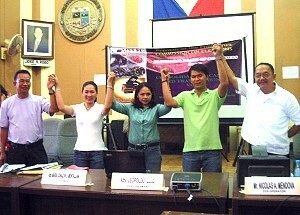 yesterday, May 13, 2010 at the Samar provincial capitol building session hall. Lawyer Maria Corazon Montallana was the attending provincial COMELEC supervisor who graced the victors’ proclamation. The Samar Provincial Board of Canvassers proclaims Sharee Ann Tan (2nd from L) and Stephen James Tan (4th from L) as gubernatorial and vice-gubernatorial winners respectively for the province of Samar on Thursday, 5:52pm, at the SP Session Hall. With wide vote margins as compared to their nearest contenders, the Tan office occupants easily garnered the nods of the public. Representative-elect Milagrosa Tan seized a total of 58,168 votes from the 16 municipalities and city of the 2nd district of Samar, while Wilfredo Estorninos and Manuel Van Torrevillas, two of her strongest political rivals, only garnered 39,430 votes and 30,888 votes respectively. The second district of Samar recorded a summed number of registered voters of 245,954; of which, only 191,512 were on the actual automated count. Meanwhile, gubernatorial champ Sharee Ann Tan palmed-in a total of 126,430 votes from the 26 municipalities and cities of the province of Samar, a 40,349 votes-lead from her fellow gubernatorial candidate Casilda Lim, trailing second, who only garnered a total of 86,081 votes. Stephen James Tan, the Vice Gubernatorial conqueror, received a total of 120, 975 votes, while the second placer, Rosenaida Rosales, only recovered a total of 91,853 votes. Registered voters for the entire province of Samar numbered at 448,268, but only 346,987 of these were able to cast their votes. Due to the delay of vote cast results from various voting centers across Samar province, the simultaneity of official proclamations for the three Tans was not absolutely considered. Paranas, a municipality of the 2nd district of Samar, was still a way late to transmit its results to the provincial Consolidation and Canvassing System which resulted in the impediment of Milagrosa Tan’s proclamation. As an outcome, her siblings Gov. Sharee Ann Tan and Vice Gov. Stephen James tan clad their proclamation slots first before hers. The siblings’ immediate proclamations as Governor and Vice Governor were easily brought in even if Paranas was still in wait of transmission because their nearest rivals were already mathematically improbable of climbing atop their votes, given that their vote margins were overwhelmingly large. However, when Paranas successfully gave off its votes cast, Milagrosa Tan, along with the winning Board Members of the 2nd district of Samar, shortly followed her children’s proclamation. Winning Board Members include Eunice Babalcon, with 51,534 votes casted; Jimmy Dy, with 49,554 votes casted; Arthur Vaughn Zosa, with 48,733 votes casted; Luzviminda Nacario, with 45,927 votes casted; and Juan Latorre Jr., with 43, 059 votes casted. With this landslide victory of the Tans, many critics are in the line to unlock grievances against the elected candidates. Reported even before the proclamation phase, the counsel of Basey Mayor and congressional candidate Wilfredo Estorninos has been in firm actions to disqualify and crack away Milagrosa Tan from her aspired position. The counsel further explains that the disqualification agendum was raised due to Tan’s nationality issues. On the contrary, Tan’s counsel refuted that his client still has an edge to gear up her candidacy. He presumed some defensive grounds that he thought already enough to cover up Milagrosa Tan’s mobility on political track. However, after COMELEC’s decision to officially proclaim Milagrosa Tan as the Representative of the 2nd District of Samar, disparaged malignancies thrown against her will have to inevitably impede in further actions. CATBALOGAN CITY – Calbayog City, some 87 kilometers north of Samar’s capital city of Catbalogan gave the Liberal Party a solid vote. Such that all candidates of the party led by then Samar’s First District Representative, Reynaldo Uy was declared mayor-elect of Calbayog City, while his party-ally, then Mayor Mel Senen Sarmiento has been elected the new Representative of First District to Congress. Congressman-elect Mel Senen Sarmiento (3rd from R) and 5 newly elected Board Members for the 1st district of Samar during their proclamation Thursday afternoon at the SP session hall of the provincial capitol. Although Sarmiento listed in his candidacy his party as Lakas-Kampi-CMD, Calbayognons maintained he belongs to the Liberal Party. Sarmiento together with his 5 co-party winners to the provincial board in the 1st District of Samar were simultaneously proclaimed by the Provincial Board of Canvassers (PBOC) Thursday afternoon at the provincial capitol building session hall. The 5 newly elected board members were Charlito Coñejos, Noel Sermense, Renato Uy, Jasper Sumagang and Prudencio Dy Jr.
On Wednesday afternoon, City Comelec Officer Jesus Java proclaimed the winners for the city of Calbayog. Liberal party winners also included the then and now Vice Mayor Ronald Aquino and Sangguniang Panlungsod (SP) members for first district Raymond Uy, Ronald Mark Aquino, Arturo Pasacas, Virgilio Clemens, Susano Salurio and Jonas Montealto. Calbayog voters also gave another solid vote for Liberal in the second district SP members such as Ray James Uy, Danilo Bernate, Julius Mancol, Regina Rabuya, Rogelio Casurao amd Virgilio Porlares. The dynamic tandem of Uy and Sarmiento in a Radyo ng Bayan interview thanked the first district for delivering them the much needed votes and vowed to sustain programs and infrastructure projects. Despite the pronounced ‘failure of elections’ in the three barangays of San Antonio, Himalarug and Mabini 1, proclamation was set. It was not clear why ‘failure of election’ happened in the mentioned barangays. NAVAL, Biliran – Two of the Espina siblings took the two highest posts in Biliran province in the recently concluded May 10, 2010 local and national elections. Biliran Governor and Congressman-elect Rogelio J. Espina who was proclaimed by Comelec on May 11, 2010 at about 7 o’clock in the evening won the congressional seat in the Lone District of Biliran by garnering 40,010 over his closest rival Congressman Glenn A. Chong who garnered 39,649 votes. In the gubernatorial post, former Biliran congressman and former Naval Mayor Gerardo J. Espina, Jr. won as the new governor-elect by garnering 32,211 votes over his rival Charles P. Chong, father of Congressman Chong who garnered 31,106 votes. Meanwhile, seven mayoralty candidates of the Nacionalista Party won out of the eight mayoralty positions at stake in the May 10, 2010 local and national elections in Biliran province. The winning candidates from congressman, governor, vice-governor, provincial board members, mayors, vice-mayors and councilors in the May 10, 2010 local and national elections in the province of Biliran based on the official list from Comelec-Biliran are the following: Congressman-Rogelio J. Espina, Governor-Gerardo J. Espina, Jr., Vice-Governor-Atty. Manuel B. Montejo Jr, provincial board members for the first district, Brigido C. Caneja III, Bebiano Jadulco, Martin Lagat and Eden S. Apolinar, provincial board members for the second district, Lorenzo Reveldez, Gina Maria B. Enage, Eriberto Tubis, Sr. and Dominador Corpin. In the municipality of Almeria, the winning candidates are Dominador O. Agajan-mayor, Richard D. Jaguros, vice-mayor and Rebecca M. Salloman, Henry O. Quijano, Leonardo A. Morillo, Amelita V. Morillo, Domingo A. Barrina, Emmanuel U. Blanco, Jasmin T. Jaguros and Alberto R. Espregante as new councilors-elect. In the municipality of Biliran, the winning candidates are: Leandro B. Enage-mayor, Antonio C. Rosal-vice-mayor and Asesclo B. Talaugon, Ernesto A. Gelizon, Oscar A. Mejia II, Emmanuel C. Rondobio, Nestor M. Lungay, Jr., Reynaldo C. Estacion, Omar T. Cabillan and Hospicio R. Tiu III as new councilors-elect. In the municipality of Cabucgayan, the winning candidates are Gemma G. Adobo-mayor, Irvin B. Cordeta-vice-mayor, and Ramon E. Amistoso, Elisa R. Oledan, Felix Cabulang, Sr., Paul T. Juntilla, Edwin T. Igano, Ruben A. Sabornido, Hildeyardo P. Enage and Rosila M. Padar as new councilors-elect. In the municipality of Culaba, the winning candidates are, reelectionist Enrico B.Uyvico-mayor, Epifanio M. Punay, Jr.-vice-mayor and Gemma R. Colobong, Carlito L. Bechaida, Humphrey B. Olimba, John Gino B. Nillos, Mailene M. Fumar, Rogelio C. Cervantes, Jesse Clyde P. Pedrosa and Lorenzo M. Reveldez, Sr. as the new councilors-elect. In the winning municipality of Kawayan, the winning candidates are: Gerardo S. Espina, Sr.-mayor, Rodolfo J. Espina, Sr.-vice-mayor and Rizalinda L. Ampong, Conrado E. Victorioso,Tani S. Patiño, Arnold B. Espadilla, Sr. Abraham A. Lequiron, Vicente V. Atok, Sr., Richmond Jay C. Seno and Sofronio S.Mendero, Sr. as the new councilors- elect. In the municipality of Maripipi, the winning candidates are: Uldarico P. Macorol-mayor, Getolio P. Casio-vice-mayor, and Nulkisam S. Macorol, Jose R. Gaviola, Arnolda R.M. Albelda, Nenita R. Radam, Felisa S. Mulles, Cirilo A. Manzanares, Dionisio N. Cabogoy, Jr. and Mervin L. Macorol as the new councilors-elect. In the municipality of Naval, the winning candidates are: reelectionist Susan V. Parilla-mayor, Atty. Redentor C. Villordon-vice-mayor and Niceto L. Limpiado, Jr., Gabino S. Velasquez IV, Gregory T. Pastor Marilou B. Lucente, Miguel J. Casas, Jr., Ramises V. Bongabong, Edwin S. Pitao and Ricardo R. Kho, Sr. as the new councilors-elect. MAASIN CITY – With the arrival of the two new flash cards yesterday for this city, including others for the nine municipalities for Southern Leyte province, official ballots were feed into the Precinct Count Optical Scan (PCOS) at the Sangguniang Panlunsod (SP) session hall here, the venue of the ongoing canvassing. As darkness took over daylight, all votes had been accounted, but it was not until 11:30 in the evening or close to midnight last night, that the winners were duly proclaimed by the City Board of Canvassers led by City Election Officer Lawrence Gelsano as chair, with Atty. Elpedio Quijada, the City Fiscal, and Pedro Escobarte, City Schools Division Superintendent, as members. Proclaimed were incumbent City Mayor Maloney Samaco who won by a convincing landslide margin against his opponent, former Governor Rosette Lerias, and incumbent Vice-Mayor Effie Abiera Sabandal, who was headed for straight victory for running unopposed. Of the ten members of the City Council, eight of them were re-electionists, while only two, Atty. Romeo Geniston and Geronimo Mercado, were the new entrants in the all-administration ticket Lakas-Kampi-CMD. Those who retained their posts were Atty. Rafael Gerong, Jr., Atty. Margarita Bantug, Rene Hatayna, Vivencio Costillas, Ricky Montalbo, Alejandro Rojas, Nestor Sy, and Antonio Cardoza. Gov. Damian Mercado, who is set to be proclaimed himself tonight as re-elected Governor, was present during the ceremonies, along with close families of the winning candidates. 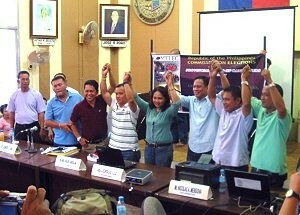 The Board of Canvassers alternately raised the hands of the winners as an indication that the elections in the city was finally over three days after the balloting on May 10. It would have been sooner, or a day right after the voting centers had closed, had there been no faulty cards, because of a fast system of counting and tallying of votes brought about by the automated procedure. In his remarks after all the picture-taking and the raising of hands, City Mayor Samaco acknowledged the cooperation and support of all those who labored hard to ensure the complete line-up victory of the administration ticket. He offered his hand and forgiveness in reconciliation to heal the wounds caused by the hot political campaign period, adding he would push for the continuation of his 13-point agenda, with emphasis on agriculture, livelihood, and education in his second term. He also acknowledged the support of Congressman Roger Mercado for the programs and projects of the city government, adding that with an imminent change of leadership at the national level he would defer to the Mercado brothers, the Governor and the Congressman, for their next move in dealing with governance under a new administration. TACLOBAN CITY – One rallyist in Naval, Biliran was hit by an unidentified gunman on or about 11:00 o’clock in the evening of May 12. Sketchy reports arriving at the PIA Regional Office showed that as the rallyists continued their vigil at the capitol compound last night, in protest of the election results in Biliran, a group of men allegedly brought the PCOS machines outside the Capitol to a waiting pick-up type vehicle using the backdoor of the compound. The rallyists who were quick to note the incident, rushed to intercept the PCOS machines and held back the unidentified men. The incident resulted in the shooting of one of the rallyists who was hit at the lower part of his breast. The victim is now being treated at a hospital. Meanwhile, the rallyists allegedly are increasing in number from 4,000 yesterday to 6,000 today. It would be recalled that supporters of defeated candidates started to band together yesterday to demonstrate their demand for manual recounting the ballots in Biliran. The winning candidates for the seats in the provincial government of Biliran and for the lone district of Biliran representative were already proclaimed by the Biliran Board of Canvassers the other day. Biliran Governor Rogelio Espina is the congressman-elect while former congressman Gerardo Espina Jr., his brother, was proclaimed as the governor-elect. The Biliran Provincial Police continuous to monitor the rally in order to ensure the maintenance of peace and order in the Province particularly at the Provincial Capitol where the rally is being held. TACLOBAN CITY – The hotly contested gubernatorial and congressional elections in the province of Biliran becomes hotter even as the winners have already been proclaimed. On May 11, the winners, Governor Roger Espina as congressman-elect, and former Congressman Gerardo Espina Jr as governor-elect, were proclaimed by the Biliran Board of Canvassers. Reports coming from PIA Biliran showed that some 4,000 Biliranons from the eight municipalities of Biliran province assembled at the Naval Cathedral compound and in the street fronting the church as they prepared to demonstrate their protest against the winning of all candidates lined up with the Espinas here to include incumbent Gov. Rogelio Espina who ran as congressman against re-electionist Congressman Glenn Chong of the lone district of Biliran. The protesting Biliranons attended a mass at the said church before marching towards the provincial capitol at about 11am Wednesday, May 12, 2010 where the provincial canvassing of ballots took place at the SP building. The rallyists brought with them placards denouncing the result of the elections and demanding that manual recounting be done. They also prevented the capitol employees from going out of the compound without undergoing body search to check if they did not carry any election documents and paraphernalias out that could highten their suspicion of election cheats. At 6:00 o’clock in the evening, the rallyists with lighted candles prayed the rosary again as they kept vigil until the next day. Close to 50 policemen were at the vicinity of the capitol compound with the presence of PNP Provincial Director Wilson Caubat to secure the place for any eventuality.